In high school I learned that blue eyes were a simple recessive gene so two brown-eyed parents could have a blue-eyed child but not vice versa. Recently I discovered that this was wrong. Many genes are involved in eye color and with the subtle variations in eye coloring. So I ran the fun eye color calculator at GEDmatch.com and discovered that it shows many of the SNPs involved in my eye color with the details of what they each do. I had not realized that blue eyes are caused by the lack of (brown) melanin, so really are no color. Blue happens the same way the color of the sky does: light is bounced around in a way that appears blue according to the wikipedia article on eye color. Maybe that is why my eyes appear greenish when I wear certain green shirts and turquoise when I wear those color shirts. The two most important genes for eye color are OCA2 and HERC2; if either one is turned off you get blue. So when, for example, a blue eyed man with OCA2 turned off marries a woman with HERC2 turned off, they can both be carrying a brown-eyed gene still and could therefore, in theory, have a brown-eyed child if they each pass on a working copy of OCA2 and HERC2. However this is really unlikely because these two genes are next to each other on chromosome 15 and so tend to get passed on together. In other words, if you have one blue-eyed gene then you usually have both of them. This is an oversimplification and please note that OCA2 has more functions than just eye color. And of course there are many variations on lighter eye color: green, gray, hazel, and so forth but these colors seem to be just variations that are in addition to the genes making blue eyes. 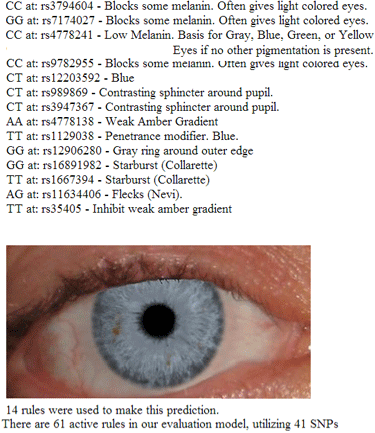 And SNPedia talks about that most important SNP for blue eyes, rs4778241, the one that led perhaps to the simplistic single recessive gene view, since it needs to be a CC at http://www.snpedia.com/index.php/Rs4778241. It is part of the OCA2 gene which is the on/off switch for melanin production. If you are tested at 23andme, you can look at what you have on rs4778241 by clicking here. The important SNP in HERC2 is Rs12913832 – with a GG there you get blue eyes 99% of the time: 23andme tests this so click here for your result. I really like what GedMatch can do, however it seems over the past week I either can not get on, or when I finally do, it takes forever to load the information, or to move from one screen to another. Am wondering if others are experiencing this as well. Those charts used in high school biology classes need to be trashed! How many kids leave class the day the chart is shared by the teacher and go home wondering if their parents really are their parents? My father’s family had blue eyes, and some had dark eyes. My maternal grandfather had “coal black” or very dark brown eyes. I have blue-ish greenish eyes that go green depending on what colors I am wearing close to my face. My sister has medium grey eyes. Cant’ put that on a chart! And what about the colour of hair? My wife has blue eyes, I have grey. Our five kids….boy blue, girl green, girl yellowy brown, boy blue, boy blue. Wife had dark brown hair, I had flaxen hair. ps Mum had blonde until she turned ten and it went dark brown. Our three boys are all blonde to fair. Eldest daughter has red/auburn hair, and number two daughter has dark brown hair. Blood groups? I have A+, wife A-: three boys are A+, two girls are O-. Just makes one try harder eh. Back in 2011 I discovered I have Dermatitis Herpetiformis. At the age of 67! http://www.dermatitisherpetiformis.org.uk/ That part I can understand as I am I1a3 haplogroup Y-DNA and U5b2b2 MtDNA. But why so late … after tests I am now gluten free since December 2012. What can you tell us about how hair color is inherited? (Perhaps you could post on this topic?) We have lots of red hair in our family. Thank you. And yes a great idea for a future blog post, thanks! In 23andme I was stated to have blue eyes with a percentage of 71% chance ( 28% of having Green eyes and 1% of Hazel eyes ) ……I have mid green eyes. They stated black hair ……….I was born blond until early teens then became brown . my paternal historical family colours are from father and GFather, black hair and light green eyes ……….this is correct. both of my sons have mid blue eyes with one born blond and changing to dark blond , while the other was born black hair and retained black hair. To conclude – I doubt any company can safely predict what a person will get in regards to eye and hair colour. I recently received my results from 23andme testing. My results said I had 68% chance of having blue eyes, 31% chance of having green eyes, and 1% chance of brown eyes. I have brown eyes. Mother has brown eyes, my father and his whole family, blue. My brother also has brown eyes. 2 of my 3 children have brown eyes, and the 3rd has green ( their father rhas green.) Where did these blue eyes go? It’s complicated … You might try uploading your raw data to GEDmatch and see if they do any better. It would seem that you have all the genes for blue except the one that is turning it off? Brown is the default, the human original before mutations giving rise to other colors. My eyes are brown, but GEDmatch and FamilyTree predict them as blue. I think I found the problem. They look at rs12913832 near OCA2. With AG there, most people worldwide would have brown eyes, but most Europeans have blue. 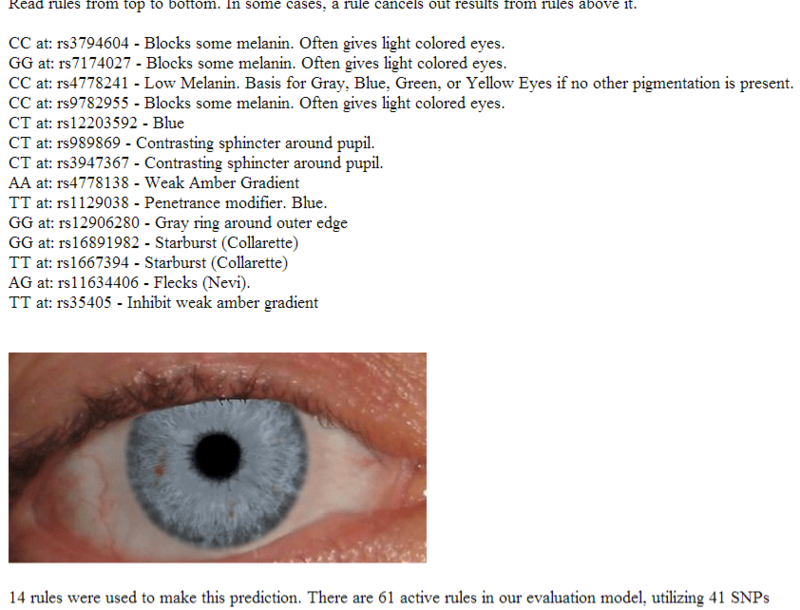 They settle this by assuming that if you’re European, then you would have blue eyes; otherwise, they’d predict brown!